When it comes to providing opportunities to people with disabilities, Westchester County is committed to doing everything it can. The Office for People with Disabilities is here to answer your questions, provide assistance or direct you to resources. 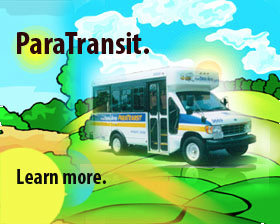 The ParaTransit system is available for those who cannot use the regular buses. Reservations are required in order to use the service and can only be made for those who have been pre-approved to use the service. Get the application form and review the process. The Bee-Line also offers a Car Service program in addition to the traditional ParaTransit program which has been expanded to selected areas of Westchester County. The regular ParaTransit and Car Service fare is $5 per one-way trip. The ParaTransit fare is now $5. All fares can be paid using exact cash or a ticket. Only blue tickets are accepted. For further information, call (914) 995-7272. Equal Access Westchester promotes accessibility for people with disabilities throughout Westchester County. It is a unique partnership between the Westchester Independent Living Center and four Westchester County organizations. The Equal Access Westchester Web site provides information on accessible transportation, dining, shopping, lodging, and recreation venues in Westchester County; ADA (Americans with Disabilities Act) information; tax incentives for businesses; and Westchester County's Livable Communities Initiative. The office maintains an online, comprehensive Disability Resource Guide to provide people with disabilities, their families and caregivers a convenient and accessible means of finding services throughout Westchester County. If you, or someone you know, might require additional assistance to leave home during an emergency, consider registering with the Special Needs Registry. The registry is for individuals with physical or mental cognitive disabilities who live on their own. The database will be provided to local municipalities to use in their emergency planning efforts. The Office for People with Disabilities arranges for sign language interpreters, works with municipalities to provide accessible parking stickers, and hosts various events such as the Annual Achievement Awards Breakfast and Annual Day at Playland in June. The county’s first baseball field, designed specifically for kids with disabilities, is located at Ridge Road Park in Hartsdale. The field is the result of a partnership between Westchester County and the Miracle League, a national non-profit organization, which aims to make baseball accessible to every child, regardless of disability. Additionally, 500 plus adults are able to play on the special, rubberized turf field in the Miracle Adult League. The office also ensures that the county is in compliance with the Americans with Disabilities Act that guarantees basic civil rights to everyone.